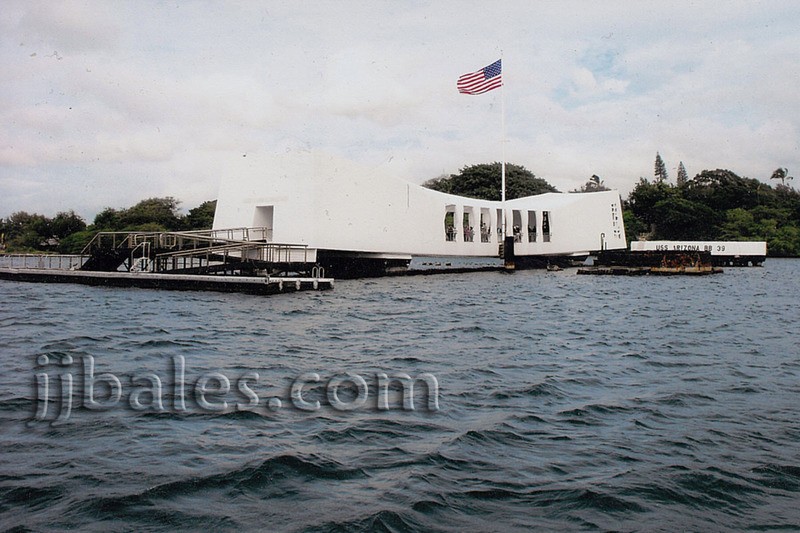 The USS Arizona Memorial, located alongside Ford Island in the middle of Pearl Harbor, Oahu, Hawaii, marks the final resting play of approximately 945 of the 1,177 crewmembers killed aboard the battleship Arizona during the Japanese attack of December 7, 1941. About fifteen minutes after the attack began at 7:55am a high-level bomb hit near the forward No. 2 turret and penetrated the deck and into the bowels of the battlewagon. At about 0810, an incredible explosion lifted the 608-foot-long, 37,654-ton Arizona out of the water and spewed a massive ball of flame and smoke hundreds of feet into the sky. A raging fire quickly engulfed the forward part of the vessel making the carnage even more horrendous. Only 337 of the Arizona’s complement of 1,514 crewmen survived making it the worst disaster in U.S. Navy history. Of the 1,177 crewmembers killed the remains (or partial remains) of approximately 232 were recovered. No accurate list of those entombed was ever ascertained because 124 of the bodies recovered could not be positively identified. Included among the dead were Capt. Franklin B. Van Valkenburgh, the skipper of the Arizona, and Rear Adm. Issac C. “Cap” Kidd Sr., the commander of Battleship Division One (ComBatDiv 1) and chief of state to Commander Battle Force (ComBatFor). Kidd, a 1906 graduate of the U.S. Naval Academy, had previously served as the Arizona’s skipper from September 1938 until February 1940 and was the highest ranking American officer killed during the attack on Hawaii. They were killed on or near the bridge and both were posthumously awarded the Medal of Honor. The idea for a major memorial to commemorate the attack on Pearl Harbor was slow to develop, as most people wanted to forget what had happened on December 7, 1941. 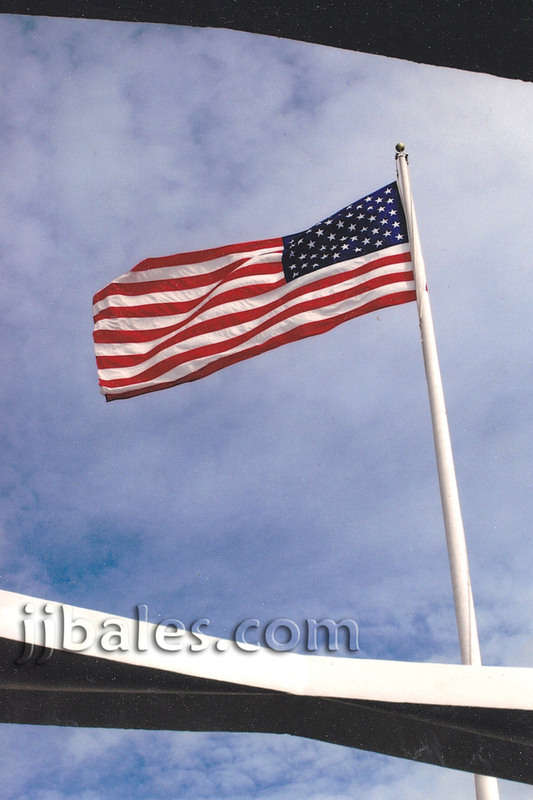 On March 7, 1950, a flagstaff was installed on the base of the Arizona’s rear mast and an American flag has been raised and lowered every day since. Later that year a wooden platform was built over the middle of her hull and in 1954 a memorial plaque was installed at the base of the flagstaff. Due to public interest the U.S. Navy also began ferrying small groups of visitors to the site. Efforts continued and in March 1958 a memorial was officially authorized to honor those lost on the Arizona. 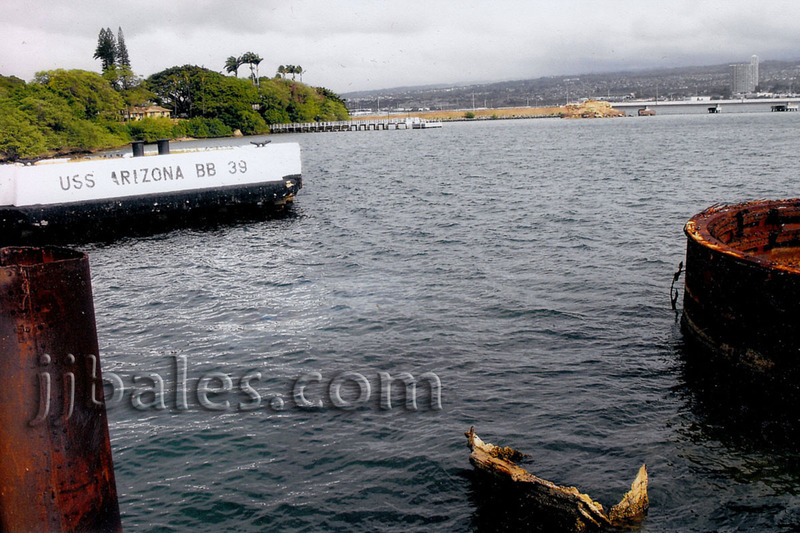 On Memorial Day, May 30, 1962, the unique 184-foot-long Arizona Memorial, designed by architect Alfred Preis and built across the amidships area of the Arizona's sunken hull, was officially dedicated. The stark white structure slopes in the center to signify the initial defeat while the elevated ends represent the final Allied victory of World War II. 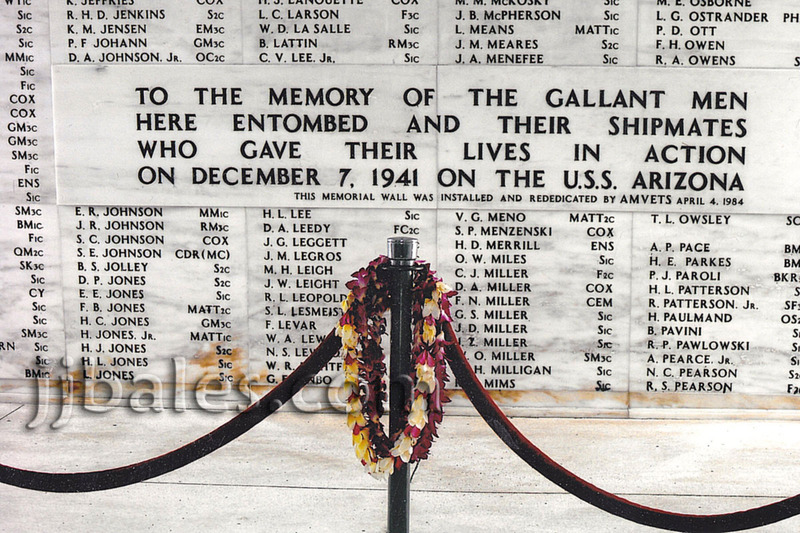 The memorial contains an initial assembly area, an open central area for observation and ceremonies, and a shrine room with a marble wall inscribed with the names of all 1,177 of the Arizona sailors and Marines that perished on December 7, 1941. It can accommodate about 200 people at one time and is the most popular tourist attraction in Hawaii with almost 1.5 million visitors a year. An official Visitor’s Center was built nearby in 1980 and features a ferry that transports people to the memorial. Over sixty years after her demise streaks of oil can still be seen seeping from the bowels of the Arizona, whose hull remains a watery tomb for approximately 945 members of her crew (and others ceremoniously entombed later). It is said that the oil streaks are tears of sorrow being shed by the mighty Arizona in remembrance of her brave boys lost on the seventh day of December, Nineteen-hundred and forty-one. These pictures were all taken on March 4, 2009. 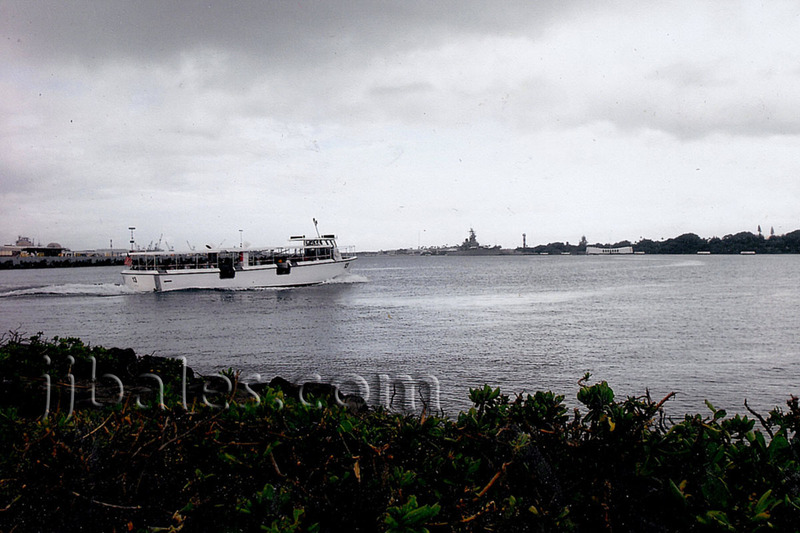 A ferry, operated by U.S. Navy personnel, departs the Visitor's Center bound for the Arizona Memorial - visible just to the right of the distant USS Missouri. 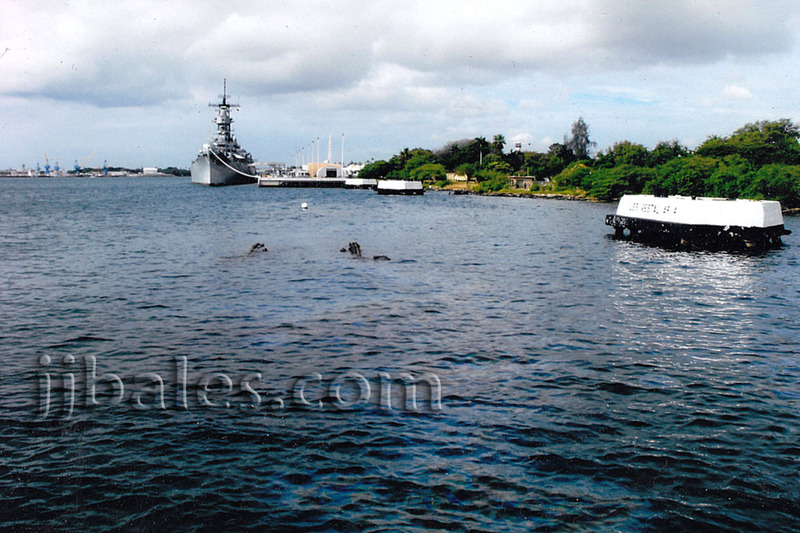 The USS Missouri was towed to Pearl Harbor and setup as a memorial in 1994. The view as you approach the docking ramp of Arizona Memorial. Onboard the Arizona Memorial and looking out over the aft section of Arizona. 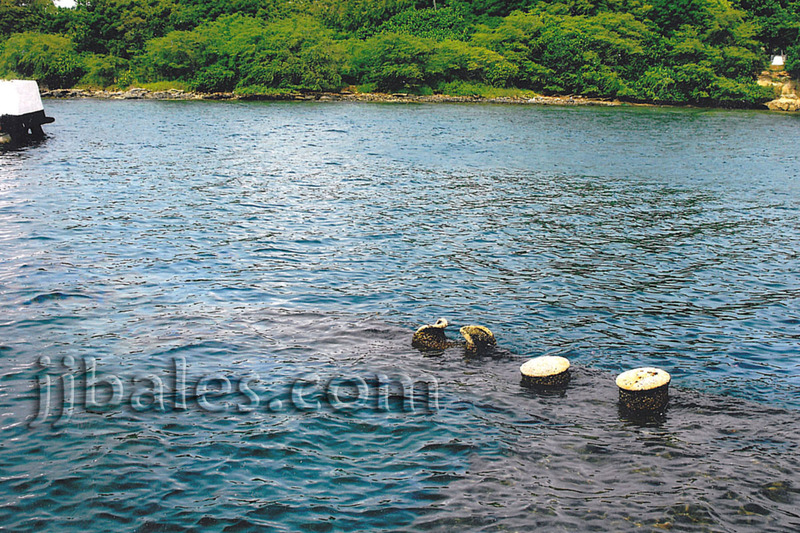 Visible is one of the old mooring quays for Berth F7 - where the Arizona rests. The bridge leading to Ford Island, opened in 1998, is visible in background. 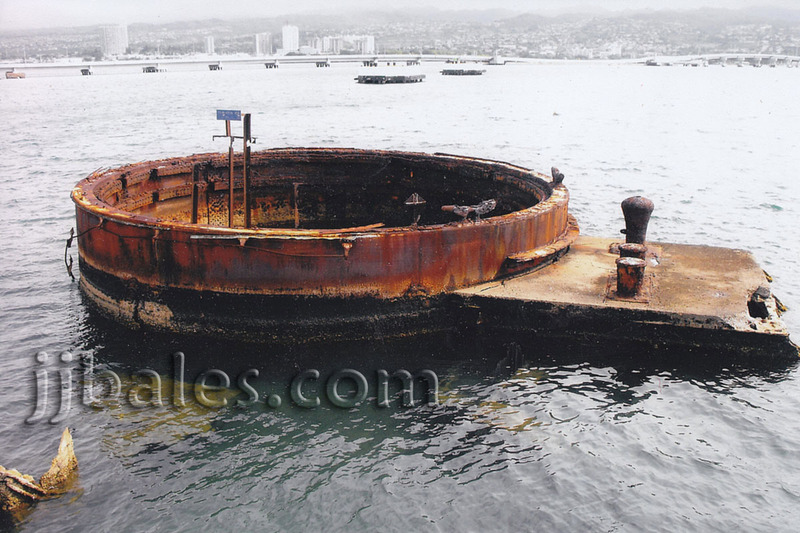 The exposed barbette where aft turret/gun #3 was once housed. The two aft sets of 14-guns were removed and put in operation as shore batteries late in World War II. Aiea Heights and neighboring areas are visible in background. Looking forward towards the submerged bow. Despite reports to the contrary the forward most barbette (#1) still has its turret and three 14-guns intact. Barbette #2 has its turret but its guns were removed. The forward section of Missouri is visible in background. Part of the Arizona's forward section exposed above the waterline. The shoreline of Ford Island can be seen in the background. 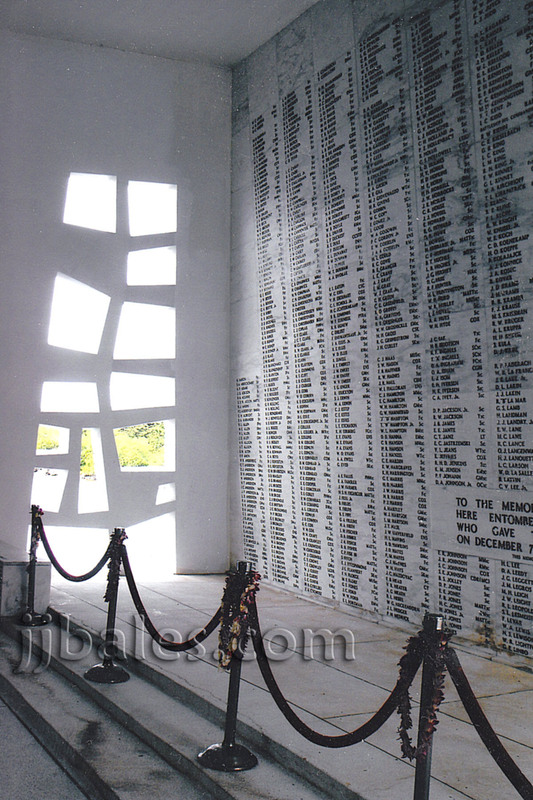 The marble memorial wall inside the shrine room inscribed with the names of all 1,177 sailors and Marines that perished. A closeup showing the name of Capt. 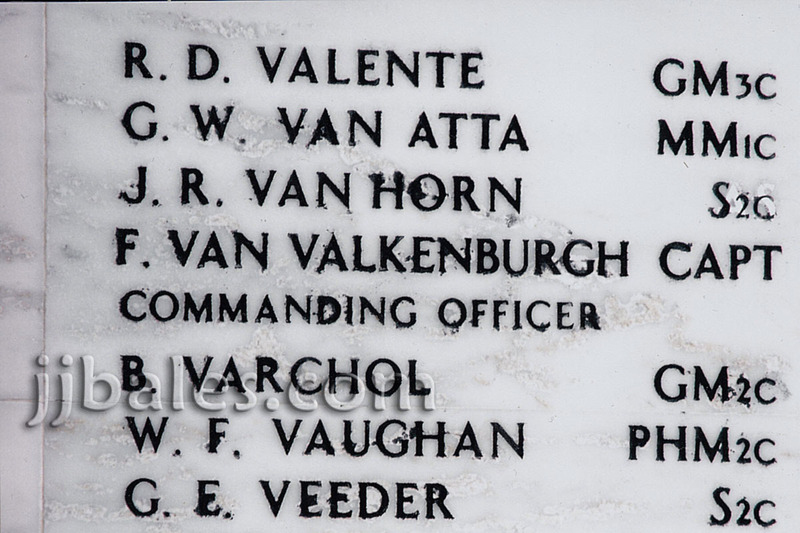 Van Valkenburgh, the Arizona's commanding officer, on the memorial wall. His remains were apparently burned to mere ashes and only his U.S. Naval Academy class ring was recovered. Another view showing the memorial wall. The flag as seen through the roof of the memorial. 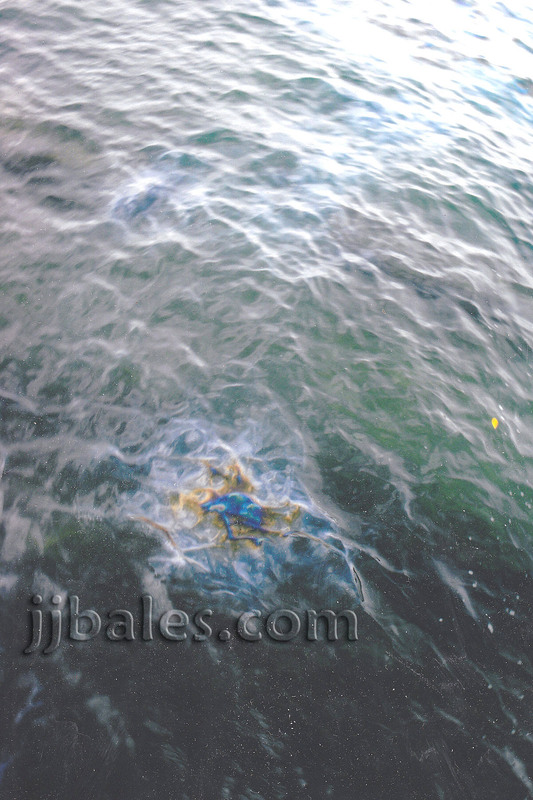 Oil still seeps from the vessel almost seventy years later. An estimated 2,300 tons of oil are still contained within the sunken vessel and this poses a serious ecological disaster if and when the hull and oil bunkers crack open.